Papaya offers top-notch Thai food in an upmarket setting. 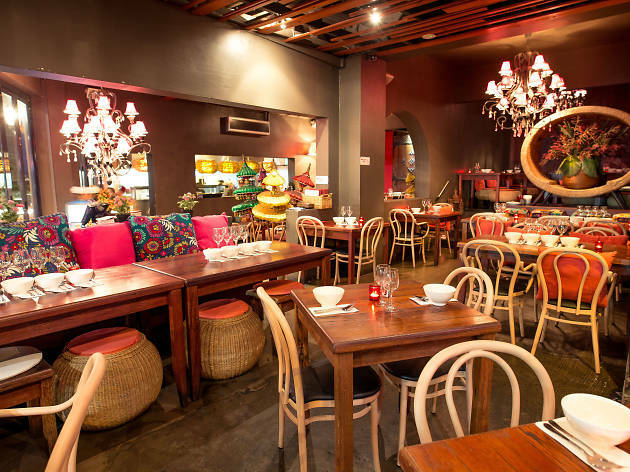 The lavishly decorated restaurant is covered in embroidered silk cushions, carved Buddhist sculptures, soft red light and wicker seating: it’s almost like a temple for Thai food. Start with po piah koong ped tod (spring rolls filled with prawn, duck and black fungi) before trying one of the house specials. For a garlicky squid dish order pla muck tod katiem, or go the theatrical kao pad sub-pra-rod: that's fried rice with chicken, king prawn, crab and vegetables served in a halved pineapple. Papaya are BYO and also do functions, takeaway and delivery.